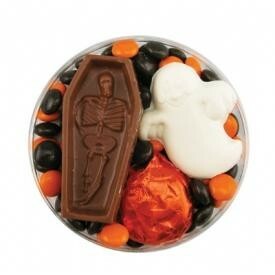 2.75oz black and orange Colorific chocolate candy Bites (compare to M&M''s), white chocolate candy ghost, milk chocolate candy coffin with skeleton, milk chocolate candy Jack O''Lantern pumpkin wrapped in orange foil. Packaged in clear round box. Price includes 4 color label on the box. Makes a great food gift or autumn fall holiday halloween promotional giveaway.